The Whitman School of Management at Syracuse University has maintained its business accreditation by AACSB International—The Association to Advance Collegiate Schools of Business. Today, 620 business schools in 38 countries—less than five percent of business schools worldwide—maintain this distinguished hallmark of excellence in management education. 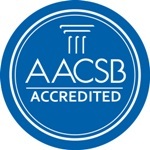 Founded in 1916, AACSB International is the longest-serving global accrediting body for business schools that offer undergraduate, master’s and doctoral degrees in business and accounting. To maintain accreditation, a business program must undergo rigorous internal review every five years, at which it must demonstrate its continued commitment to 21 quality standards relating to faculty qualification, strategic management of resources, interactions of faculty and students, as well as a commitment to continuous improvement and achievement of learning goals in degree programs. The Whitman School’s achievement will be recognized in late April at the 2011 AACSB International Conference and Annual Meeting in New York City.